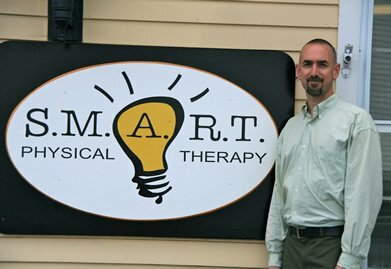 My name is Tim McCullough, President of SMART Physical Therapy. With the support of my lovely wife Erica and my three super sons Rowan, Aidan and Devin I will be starting this exciting new Physical Therapy Practice in the beautiful town of New London, New Hampshire. I have been a Physical Therapist for nearly 17 years and look forward to providing Physical Therapy services to the people of this amazing community. My focus has always been on becoming the best clinician and giving the highest quality of care to my clients. I have taken extensive continuing education courses, stayed current on cutting edge research and treatment techniques, and been taught and mentored by some of the best therapists in the United States and abroad. SMART Physical Therapy is designed to create the optimal environment to provide successful Physical Therapy care for everyone in the community. Provide the same highly trained licensed Physical Therapist for every appointment at our facility. Participate with a vast number of Insurance companies to providing coverage for a large portion of the community. Have an affordable Direct Access program where clients can receive Physical Therapy without insurance or without a referral from a doctor. Provide equipment of the highest quality and the best facility for successful outcomes to a wide variety of conditions and patient populations. Have clinic hours that can better serve the working and student population who may need early, late, or even weekend hours. Provide "cutting edge" Spine care from a Physical Therapist who has been trained by some of the leading clinicians and researchers in the world on Low Back and Pelvic Pain. Provide Sports Medicine care from a Physical Therapist who is also a Certified Athletic Trainer who has worked with Athletes at the High School, College, Olympic, and Professional level. Use SMART Treatment Principles and take the the time to hear the clients story, assess the cause of their problem, and treat the cause rather than treating their symptoms. Teach community members, students and fellow professionals about Physical Therapy, Sports Medicine and injury prevention, improving the health of our community. Copyright © 2011-2017 smartptnh.com. All Rights Reserved.